Regulatory T (Treg) cells are a subpopulation of CD4+ T cells. Their main function is the suppression and termination of pro-inflammatory immune responses. This is a unique aspect of immune processes and thus, Treg cells play a crucial role in several human diseases. They are identified by a combination of different cell surface markers and described mainly as CD4+CD25hi and CD127dim/- along with the presence of intracellular transcription factor FoxP3, which is essential for the development and stability of the Treg cell phenotype. Treg cells represent approximately 1–4% of peripheral blood mononuclear cells (PBMCs). Several Treg cell subsets are described in the literature, all varying slightly from one another either by cell surface marker expression, secreted effector cytokines, or origin. For example, Tregs that develop in the thymus are called natural Treg (nTreg) cells, whereas Treg cells that differentiate in the periphery from conventional naive T cells are called induced Treg (iTreg) cells. Both subsets have similar phenotypic characteristics and comparable suppressive function, but exhibit specific differences, including epigenetic modification of the FoxP3 gene and phenotype stability (PMID: 17694575). Treg cells also appear in blood in different developmental stages, such as naive and effector Treg cells. Treg cells may be isolated directly from whole blood, requiring no upfront sample preparation. For some applications, blood, buffy coat, or buffy cone are first processed to generate PBMCs. For detailed information, see the MACS Handbook chapter human blood. Miltenyi Biotec has developed numerous products for the straightforward magnetic separation of Treg cells and distinct Treg subsets. Treg cells can be isolated either straight from whole blood without density gradient centrifugation and erythrocyte lysis, or from PBMCs after density gradient centrifugation. All kits are based on a two-step isolation strategy: depletion of non-target cells followed by positive selection of target cells. Isolation of CD4+CD25+ Treg cells directly from whole blood in less than 30 min. The MACSxpress Treg Isolation Kit, human enables fast isolation of Treg cells from up to 30 mL of freshly drawn anticoagulated whole blood without density gradient centrifugation. The isolation of CD4+CD25+ Treg cells is performed with only one labeling step and in a two-step separation procedure. During the first isolation step, erythrocytes are aggregated and sedimented, while non-CD4+ and the majority of CD127hi cells are removed by immunomagnetic depletion with MACSxpress Beads. In a second enrichment step, CD25+ cells are magnetically sorted over a MACS Column. The eluted cell fraction represents the CD4+CD25+ Treg cells, which can be used immediately for further downstream analyses. Example isolation of CD4+CD25+ Treg cells. Human EDTA-anticoagulated whole blood (8 mL) was processed using the MACSxpress Treg Isolation Kit, an LS Column, an overhead rotator, a MidiMACS™ Separator, and a MACSxpress Separator. 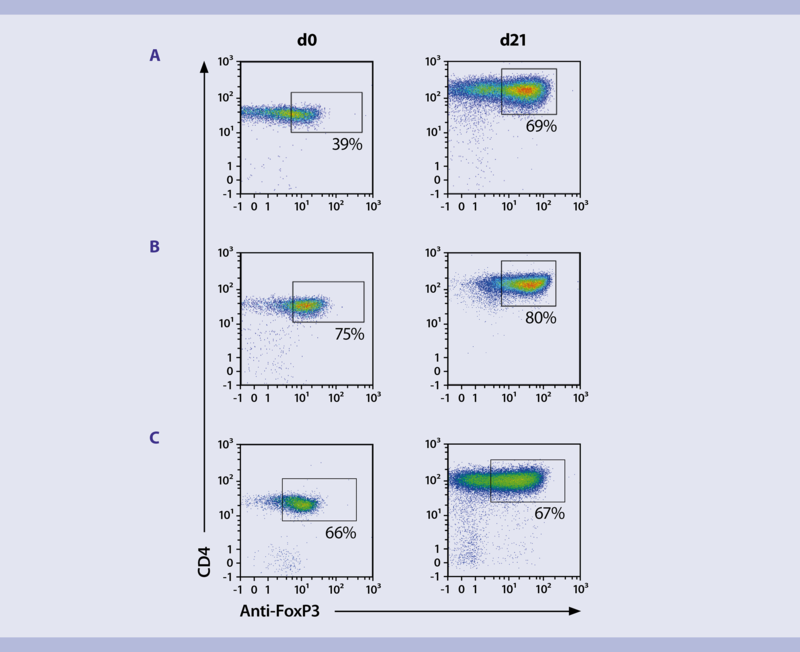 Cells were taken before and after separation and fluorescently stained with CD45-VioBlue®, CD4-FITC, CD25-PE, and CD127-APC for flow cytometry analysis using the MACSQuant® Analyzer. Cell debris, non-leukocytes, and dead cells were excluded from the analysis based on CD45 expression, scatter signals, and propidium iodide fluorescence. Example isolation of CD4+CD25+ Treg cells. Human EDTA-anticoagulated whole blood (8 mL) was processed using the MACSxpress Treg Isolation Kit, an LS Column, an overhead rotator, a MidiMACS™ Separator, and a MACSxpress Separator. Cells were taken before and after separation and fluorescently stained with CD45-VioBlue®, CD4-FITC, CD25-PE, and CD127-APC for flow cytometry analysis using the MACSQuant® Analyzer. Cell debris, non-leukocytes, and dead cells were excluded from the analysis based on CD45 expression, scatter signals, and propidium iodide fluorescence. The CD4+CD25+ Regulatory T Cell Isolation Kit, human performs isolation in two steps. First, the non-CD4+ cells are indirectly magnetically labeled with a cocktail of biotin-conjugated antibodies as primary labeling reagent, and anti-biotin monoclonal antibodies conjugated to MicroBeads as secondary labeling reagent. The labeled cells are depleted by separation over a MACS Column. In the second step, CD4+CD25+ Treg cells are directly labeled with CD25 MicroBeads and isolated by positive selection from the pre-enriched CD4+ T cell fraction. The magnetically retained CD4+CD25+ Treg cells are eluted as the positively selected cell fraction. CD4+CD25+ regulatory T cells isolated from human PBMCs. Human PBMCs were processed using the CD4+CD25+ Regulatory T Cell Isolation Kit, an LD and two MS Columns, a MidiMACS and a MiniMACS™ Separator. The cells were fluorescently stained with CD4 (VIT4)-VioBlue, CD25-APC, clone 4E3, and CD127-PE (A), or CD4 (VIT4)-VioBlue, CD25-PE, clone 4E3, and Anti-FoxP3-APC (B) and analyzed by flow cytometry using the MACSQuant® Analyzer. Cell debris and dead cells were excluded from the analysis based on scatter signals and propidium iodide fluorescence. Gating was performed according to CD4 expression (except for the CD25-APC versus CD4 (VIT4)-VioBlue dot plot). CD4+CD25+ regulatory T cells isolated from human PBMCs. Human PBMCs were processed using the CD4+CD25+ Regulatory T Cell Isolation Kit, an LD and two MS Columns, a MidiMACS and a MiniMACS™ Separator. The cells were fluorescently stained with CD4 (VIT4)-VioBlue, CD25-APC, clone 4E3, and CD127-PE (A), or CD4 (VIT4)-VioBlue, CD25-PE, clone 4E3, and Anti-FoxP3-APC (B) and analyzed by flow cytometry using the MACSQuant® Analyzer. Cell debris and dead cells were excluded from the analysis based on scatter signals and propidium iodide fluorescence. Gating was performed according to CD4 expression (except for the CD25-APC versus CD4 (VIT4)-VioBlue dot plot). Isolation of CD4+CD25+CD127dim/– Treg cells with the CD4+CD25+CD127dim/– Regulatory T Cell Isolation Kit II, human is also performed in two steps. A cocktail of biotinylated antibodies and Anti-Biotin MicroBeads are used to deplete the non-CD4+ and CD127high cells in the first step. Then, the flow-through fraction of pre-enriched CD4+CD127dim/– T cells is labeled with CD25 MicroBeads for subsequent positive selection of CD4+CD25+CD127dim/– Treg cells. CD4+CD25+CD127dim/– regulatory T cells isolated from human PBMCs. Isolation was performed using the CD4+CD25+CD127dim/– Regulatory T Cell Isolation Kit II, an LD and two MS Columns, a MidiMACS™ Separator and a MiniMACS™ Separator. 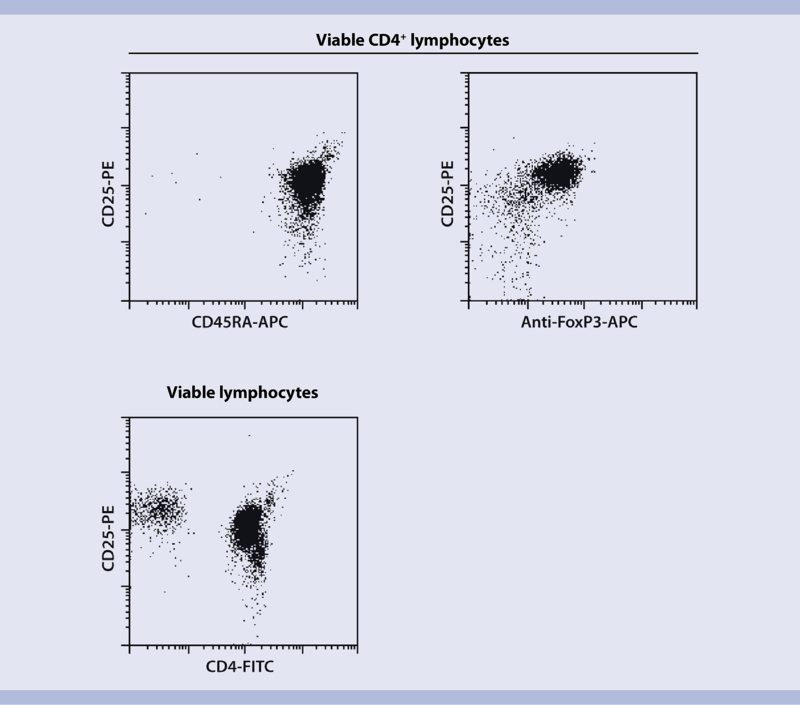 The cells were fluorescently stained with CD4-FITC, CD25-APC, and CD127-PE, or CD4-FITC, CD127-PE, and Anti-FoxP3-APC and analyzed by flow cytometry using the MACSQuant® Analyzer. Gating was performed according to CD4 expression, except for the CD25-APC vs. CD4-FITC dot plot. CD4+CD25+CD127dim/– regulatory T cells isolated from human PBMCs. Isolation was performed using the CD4+CD25+CD127dim/– Regulatory T Cell Isolation Kit II, an LD and two MS Columns, a MidiMACS™ Separator and a MiniMACS™ Separator. The cells were fluorescently stained with CD4-FITC, CD25-APC, and CD127-PE, or CD4-FITC, CD127-PE, and Anti-FoxP3-APC and analyzed by flow cytometry using the MACSQuant® Analyzer. Gating was performed according to CD4 expression, except for the CD25-APC vs. CD4-FITC dot plot. The CD25+CD49d– Regulatory T Cell Isolation Kit, human first labels and magnetically depletes CD8+ and CD49d+ cells with a cocktail of CD8 and CD49d MicroBeads. In the second step, CD49d– Treg cells are labeled with CD25 MicroBeads and isolated by positive selection from the pre-enriched T cell fraction. The depletion of CD49d+ cells removes contaminating CD25+ effector T cells1, thus providing highly pure populations of Treg cells. 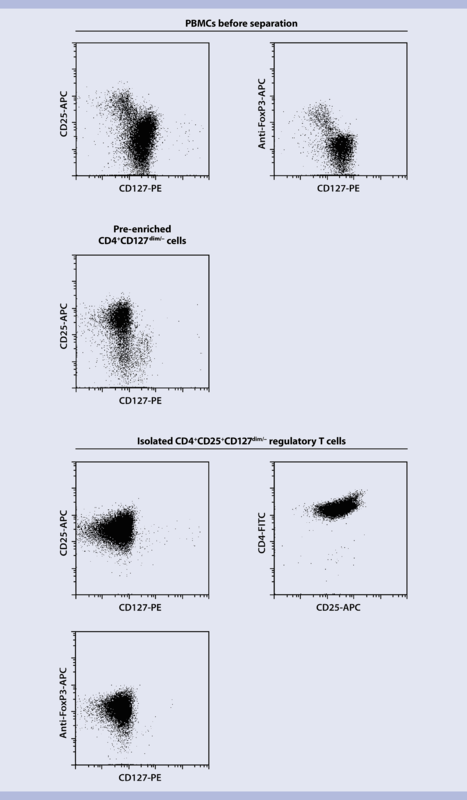 CD25+CD49d– regulatory T cells isolated from human PBMCs. Isolation was performed using the CD25+CD49d– Regulatory T Cell Isolation Kit, an LD Column, two MS Columns, a MidiMACS Separator, and a MiniMACS Separator. Cells were fluorescently stained with CD4-FITC, CD25-PE, CD49d-Biotin, and Anti-Biotin-APC or with CD4-FITC, CD25-PE, and Anti-FoxP3-APC and analyzed by flow cytometry using the MACSQuant® Analyzer. 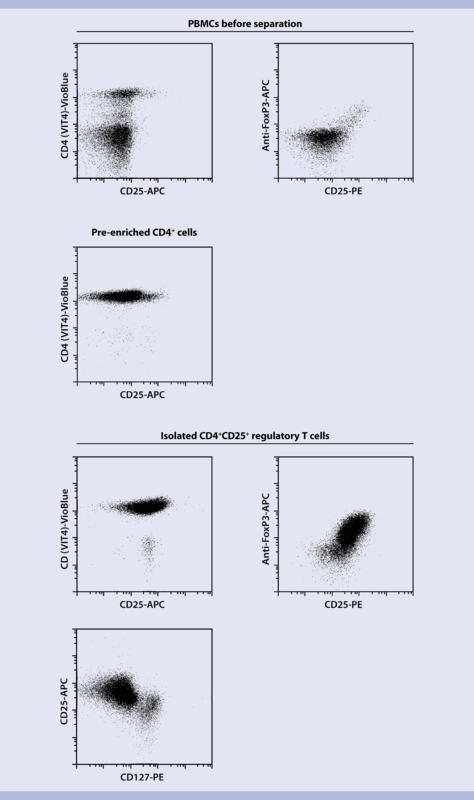 CD25+CD49d– regulatory T cells isolated from human PBMCs. Isolation was performed using the CD25+CD49d– Regulatory T Cell Isolation Kit, an LD Column, two MS Columns, a MidiMACS Separator, and a MiniMACS Separator. Cells were fluorescently stained with CD4-FITC, CD25-PE, CD49d-Biotin, and Anti-Biotin-APC or with CD4-FITC, CD25-PE, and Anti-FoxP3-APC and analyzed by flow cytometry using the MACSQuant® Analyzer. Finally, isolation of CD4+CD25+CD45RA+ Treg cells is performed in a two-step procedure using the CD4+CD25+CD45RA+ Regulatory T Cell Isolation Kit, human. First, non-CD4+ and memory T cells are indirectly magnetically labeled with a cocktail of biotin-conjugated antibodies and Anti-Biotin MicroBeads, and depleted over a MACS Column. In the second step, the flow-through fraction of pre-enriched CD4+CD45RA+ T cells is labeled with CD25 MicroBeads for subsequent positive selection of CD4+CD25+CD45RA+ Treg cells. CD4+CD25+CD45RA+ regulatory T cells isolated from human PBMCs. Isolation was performed using the CD4+CD25+CD45RA+ Regulatory T Cell Isolation Kit, an LD and two MS Columns, a MidiMACS Separator, and a MiniMACS Separator. The isolated cells were fluorescently stained with CD4, CD25, and either CD45RA or Anti-FoxP3 antibodies. Dot plots show data gated on viable lymphocytes or viable CD4+ lymphocytes. CD4+CD25+CD45RA+ regulatory T cells isolated from human PBMCs. Isolation was performed using the CD4+CD25+CD45RA+ Regulatory T Cell Isolation Kit, an LD and two MS Columns, a MidiMACS Separator, and a MiniMACS Separator. The isolated cells were fluorescently stained with CD4, CD25, and either CD45RA or Anti-FoxP3 antibodies. Dot plots show data gated on viable lymphocytes or viable CD4+ lymphocytes. Treg cells can be discriminated from other CD4+ T cells via flow cytometry using a combination of different cell surface markers and, most specifically, the transcription factor FoxP3. There is no unique marker for Treg cell identification. Thus, a specific and reproducible flow cytometry staining strategy is critical to avoid contamination with other cell types. 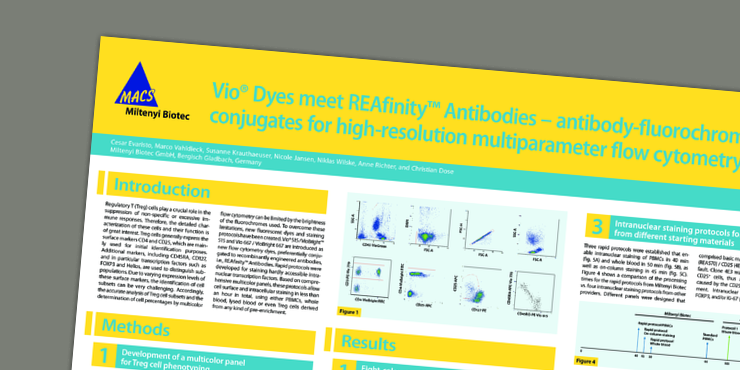 Vio® Dyes meet REAfinity™ Antibodies – antibody-fluorochrome conjugates for high-resolution multiparameter flow cytometry analysis. Because the transcription factor FoxP3 is one of the most reliable markers to identify Treg cells, intracellular flow cytometry staining is essential for Treg cell research. The ready-to-use FoxP3 Staining Buffer Set was developed specifically for use in conjunction with Anti-FoxP3 antibodies to ensure the most reliable intracellular staining. The dedicated Treg Detection Kit (CD4/CD25/FoxP3), human includes CD4, CD25, and FoxP3 fluorescent antibodies as well as the FoxP3 Staining Buffer Set to enable detection of Treg cells based on the two cell surface markers (CD4 and CD25) and the FoxP3 intracellular marker. Under some circumstances, Treg cells secrete anti-inflammatory cytokines. Treg cells secreting IL-10 can be detected at a single-cell level with the IL-10 Secretion Assay – Detection Kit (PE), human, and enriched with the IL-10 Secretion Assay – Cell Enrichment and Detection Kit (PE), human. Antigen-reactive Treg cells can be identified, enriched, and analyzed via antigen-reactive T cell enrichment (ARTE) in combination with the CD137 MicroBead Kit, human. ARTE has been applied successfully to study antigen-specific Treg cells and is described in various publications (PMID: 23479226, 24301658, 27773482, 25172488). Regulatory T cells are a small population and, therefore, their expansion before downstream analysis is sometimes required. A perfectly harmonized product combination of TexMACS Medium, premium-grade Human IL-2, and the Treg Expansion Kit, human optimizes stimulation conditions for in vitro Treg cell expansion. The result is efficient and reliable expansion of Treg cells with stable FoxP3 expression and retained Treg phenotype. FoxP3 expression analysis after in vitro Treg expansion. 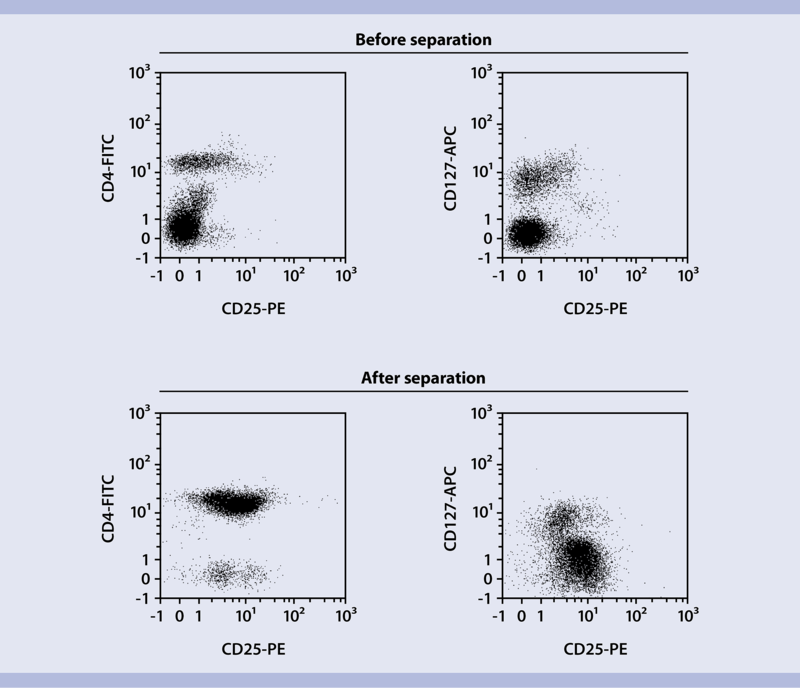 Human Treg cells were isolated with either the (A) CD4+CD25+ Regulatory T Cell Isolation Kit, human, the (B) CD4+CD25+CD127dim/– Regulatory T cell Isolation Kit, human, or the (C) MACSxpress Treg Isolation Kit, human. The cells were analyzed for their FoxP3 expression directly after isolation (d0, left column) or 21 days (d21, right column) after in vitro expansion using the Treg Expansion Kit, human, TexMACS Medium, and IL-2. FoxP3 expression analysis after in vitro Treg expansion. 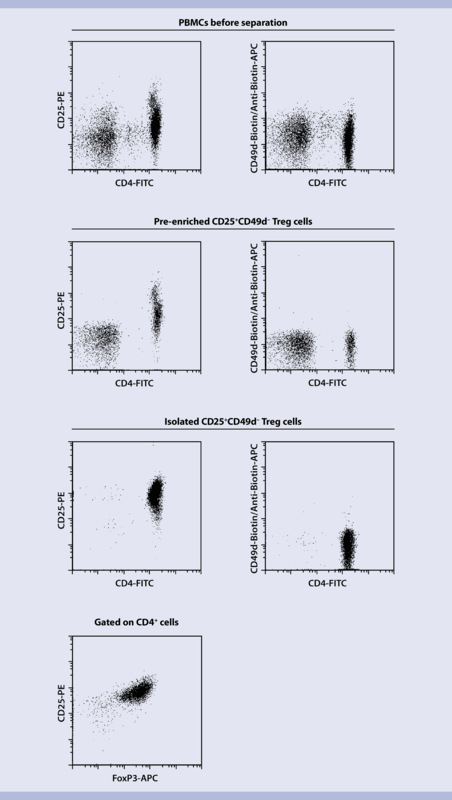 Human Treg cells were isolated with either the (A) CD4+CD25+ Regulatory T Cell Isolation Kit, human, the (B) CD4+CD25+CD127dim/– Regulatory T cell Isolation Kit, human, or the (C) MACSxpress Treg Isolation Kit, human. The cells were analyzed for their FoxP3 expression directly after isolation (d0, left column) or 21 days (d21, right column) after in vitro expansion using the Treg Expansion Kit, human, TexMACS Medium, and IL-2. The suppression assay is one of the most common assays to test the functionality of Treg cells in vitro. Treg cells are cocultured with responder T cells (Tresp) and a proliferative stimulus (either polyclonal or antigen-specific). During coculture, functional Treg cells suppress the proliferation of Tresp cells. The Treg Suppression Inspector, human is a polyclonal stimulus optimized for T cell stimulation in a suppression assay. This cell culture tool stimulates Tresp cells in a way that Treg cells can suppress their proliferation reliably, and facilitates convenient handling and standardized conditions for reproducible results. Analysis of an in vitro suppression assay. CD4+CD25+ Treg cells and CD4+CD25– Tresp cells were isolated using the CD4+CD25+ Regulatory T cell Isolation Kit, human. For the suppression assay, Tresp cells labeled with a cell-tracking dye, Treg cells, and the Treg Suppression Inspector were cocultured in different ratios. After 5 days, cells were fluorescently stained with CD4-VioBlue and CD25-PE. (A) Gating strategy to distinguish Treg cells and Tresp cells and to enable further analysis of Tresp cell proliferation (ratio Tresp:Treg was 8:1). 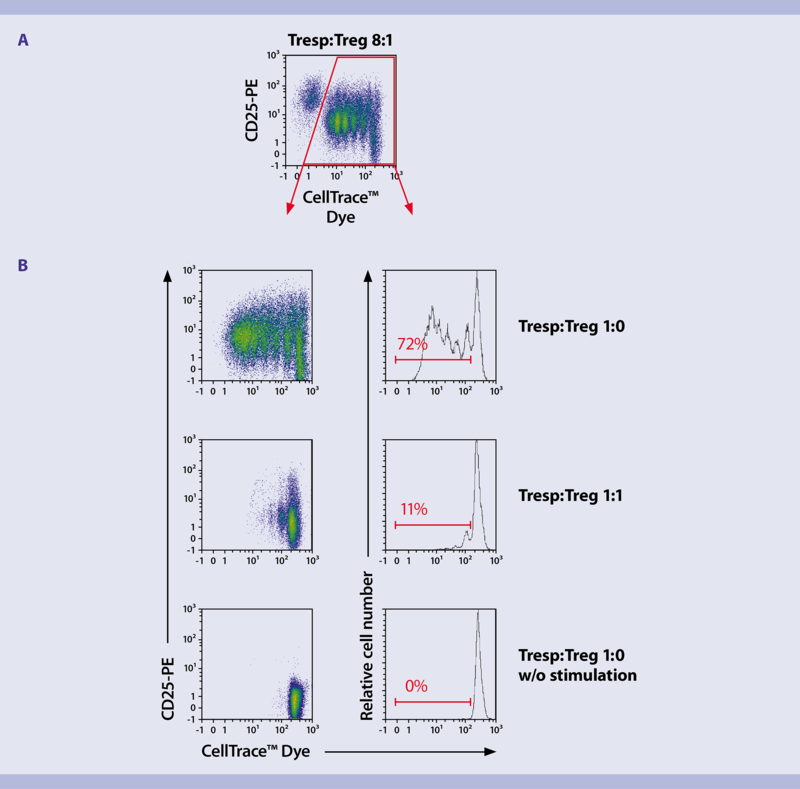 (B) Representative flow cytometry plots showing dilution of the cell-tracking dye at different culture conditions (upper row: Tresp:Treg 1:0, middle: Tresp:Treg 1:1, lower row: Tresp:Treg 1:0 cultured without Treg Suppression Inspector, human). Analysis of an in vitro suppression assay. CD4+CD25+ Treg cells and CD4+CD25– Tresp cells were isolated using the CD4+CD25+ Regulatory T cell Isolation Kit, human. For the suppression assay, Tresp cells labeled with a cell-tracking dye, Treg cells, and the Treg Suppression Inspector were cocultured in different ratios. After 5 days, cells were fluorescently stained with CD4-VioBlue and CD25-PE. (A) Gating strategy to distinguish Treg cells and Tresp cells and to enable further analysis of Tresp cell proliferation (ratio Tresp:Treg was 8:1). (B) Representative flow cytometry plots showing dilution of the cell-tracking dye at different culture conditions (upper row: Tresp:Treg 1:0, middle: Tresp:Treg 1:1, lower row: Tresp:Treg 1:0 cultured without Treg Suppression Inspector, human). CellTrace is a trademark of Thermo Fisher Scientific.